First, you would need to investigate any organization that is financially related. Any organization, be it a bank, a treasury, an insurance community, a store, a gas station, an advertising agency, and much more, is all a pyramid. As soon as financial flows cease to flow to any organization, the organization will declare itself bankrupt. Yep, it is a GREAT club. No doubt. And with such a great track history too....you know what they say...4th try is the charm. I guess when a scam like this gets shut down it's just....try, try...try, try again. Again, my sweet Nigerian Prince, if you advertise this to 10,000 I'm pretty sure 1 or 2 will bite...at $100 each USD, prolly more than you make the whole year from whatever country you are from. No doubt, must be nice to scam 2 people a year and live high off the hogs. Marshall island's huh? what's the cost of living down on the islands...guessing that's just the shell company used to launch the site. Still trying to lure people into your scam club there Bob? Have to leave it all in there for 2 weeks you say? What happens in 2 weeks Bob? is the state coming with trucks to take it all away...you know...for the FOURTH TIME ??? How's it going? making a lot of money? Giving away 20% now...ohh should I bite now...or wait until it's 30% next week? You get it up around 40-45% you MIGHT actually get some suckers to fall for it. You can make a donation and make a withdraw at any time and without restrictions. Bob Cheung wrote: Greetings, dear friends! Even when the cryptocurrency market is slumping and all coins are getting cheaper, ELD price continues to grow. ELDORADO guarantees stable 30% earnings per month which is profitable even if the market is slumping. Assuming they are still at the required donation level? which is $188? And when the coin value drops in half...then they only have $92 in their fund and no longer get any additional percent until they put in MOAR funds to get back up to that $188 level to qualify? If the coins go up 100X they may hit the 2nd level required for donations on the upswing, in the meantime have to keep adding funds to get 1%. If you mean about opening a level to receive referral bonuses, then when a cryptocurrency exchange rate goes down, this does not affect the open level. The cryptocurrency rate, as well as the entire cryptographic market, is now in decline. 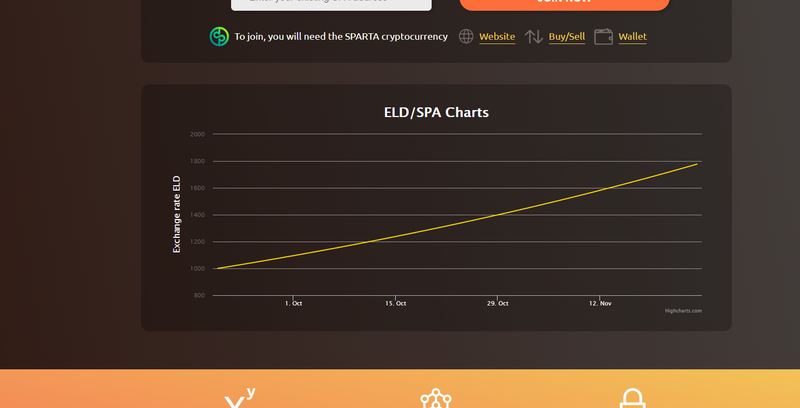 SPARTA has cryptocurrency advantage because The price is at its lowest. For the first three links there is no specifics. For example, I, name. date of donation, SPARTA rate, amount, in dollars or in Bitcoin. I wanted to withdrawl that I did or did not do it, why, for what amount I claimed and so on. The fourth link - even the attention should not be paid, they are true crooks. These are people who aim to steal investors' money. Just look at their website mmmglobal.world there is no normal translation into the languages ​​of the world. But there is a built-in Google translator. Their model is MLM and matrix. Give proof. that ELDORADO is a scam! 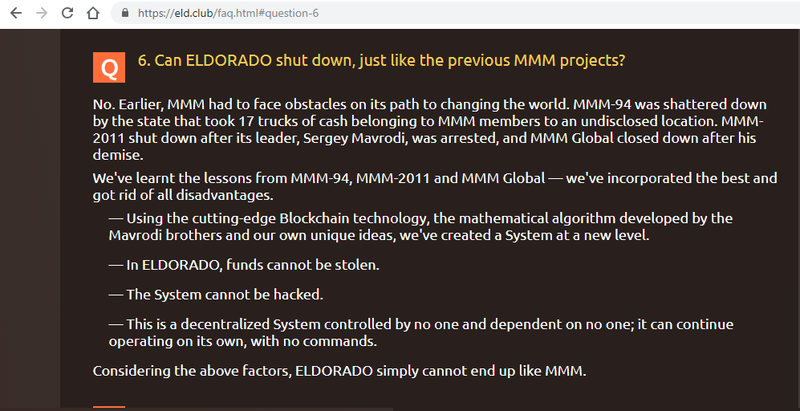 I make a donation and withdrawal from ELDORADO. at any time, and without any problems. Bob Cheung wrote: I make a donation and withdrawal from ELDORADO. at any time, and without any problems. Bob Cheung wrote: - This special offer is valid on November 13, from 00:00 till 23:59 GMT. So what happens after November 28th? Will the website still be operating? That is a lovely line graph...so nice and perfectly straight. I'm pretty sure that's legit right? Everything in cryptoworld makes nice lines, no fluxing at all. market takes a 30% nosedive in 2 weeks, but your so nice and perfectly profitable still on a slope=1.